The trend for vintage wedding flowers has really revived the beautiful English country garden look. It's a style that lends itself to a very natural organic look through the use of old-fashioned perfumed flowers. By choosing a mixed bouquet of flowers with a small amount of foliage running throughout the bouquet you are able to create a vintage look. You'll see from the bouquets below that a mixture of more traditional flowers such as roses, freesia and lisianthus give you that natural garden look. 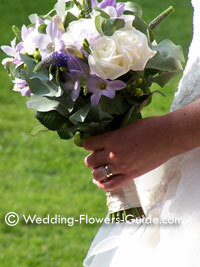 Many brides that opt for a vintage flowers also ask me for flowers with a fragrance. The best flowers to incorporate are freesias as they are guaranteed to smell beautiful. Roses can smell wonderful but some roses that are commercially grown can lack fragrance. Other great choices include the use of peonies and eucalyptus, which are both beautifully fragrant. You can see from the photo below how we have recreated a natural wild garden look into these vintage style table centrepieces. The use of traditional flowers such as stocks and freesias gave the room a fabulous fragrance. 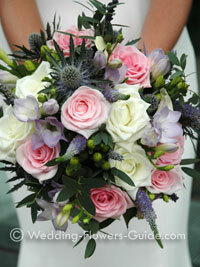 Other flowers that we used to complete this look are roses, lisianthus, thistle and chrysanthemum daisies. 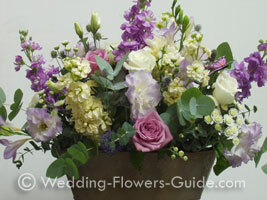 The whole arrangement is presented in a galvanised container to stick to the rustic theme. These arrangements also make perfect gifts to give away at the end of the evening. Accessories that can also be incorporated into your vintage wedding flowers are diamantes, pearls, brooches and velvet ribbon.